For my daughters third birthday a few weeks ago I had planned to make her a barbie cake since she has been liking barbies lately and she said that was what she wanted. 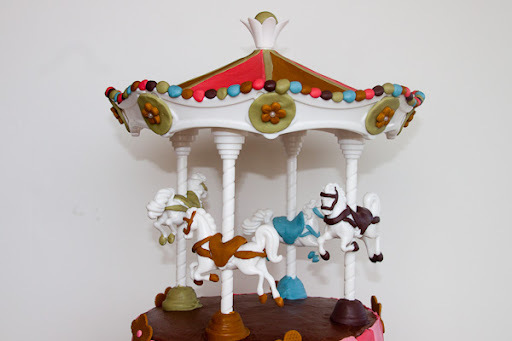 Well about a month or two before her birthday in a week where I made a few to many trips to Michaels and Joann's my daughter spotted the Wilton Carousel Cake topper box and kept saying she wanted it. So I looked to see how much it was and it was $24 for the just the plastic top, poles and horses and I was not going to spend that much money on it. I am cheap! 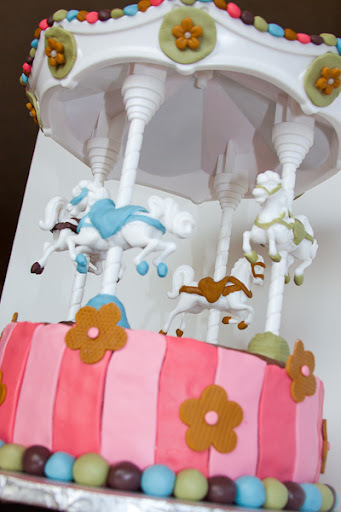 Anyway I looked at the box and inspected it to see if I thought I could do it and thought I possibly could so when a 50% off coupon came available for JoAnn's I purchased the carousel topper. 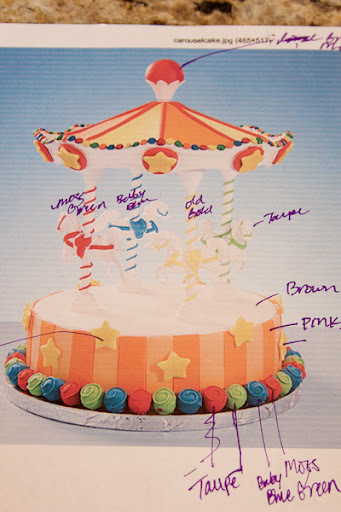 Then I found this version of the Wilton cake on a website and started my planning from there. Ok so I did not think it was going to take me two days to decorate this cake but it did indeed. I did not want to use the colors they used on the box and in the picture I found, so I found my inspiration from a piece of scrap book paper. 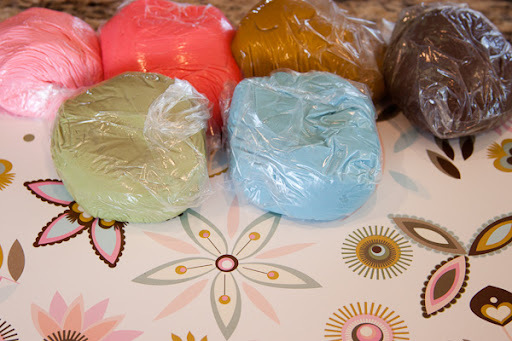 How long did it take to color my fondant you ask? Well about 1.5 hours. 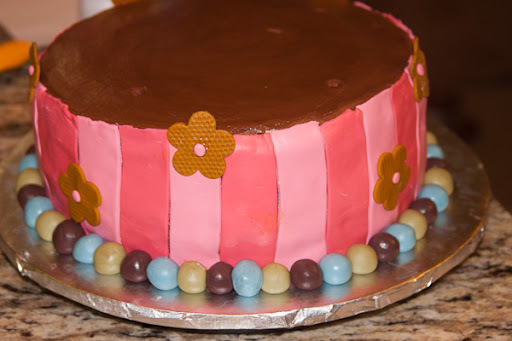 I could not believe it, I had a hard time getting the dark pink color pink, and the purple was supposed to be the taupe color but I just gave up on it because my hands and arms where so tired of kneading the fondant! 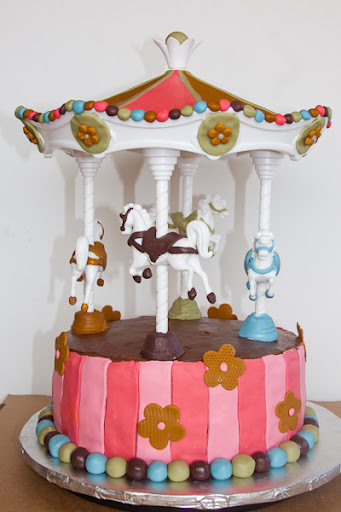 I learned that I should color my fondant the day prior but I did not have that luxury because I did not start until the day before my daughter birthday. I made my own MMF (Marsh-mellow Fondant) because it taste so much better but my fondant was too soft. I needed way more powdered sugar kneaded into it but I was tired of adding to it so I gave up and started decorating. Here is the smoothed butter cream before adding the stripes. 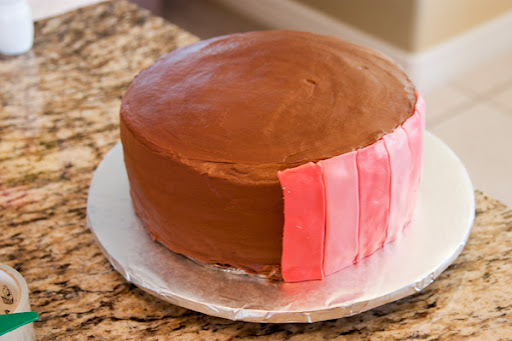 It took another hour just to roll out and cut the strips of fondant to cover 3/4's of the cake. It would have been faster if my MMF would have been stiffer but these are things I need to learn right? 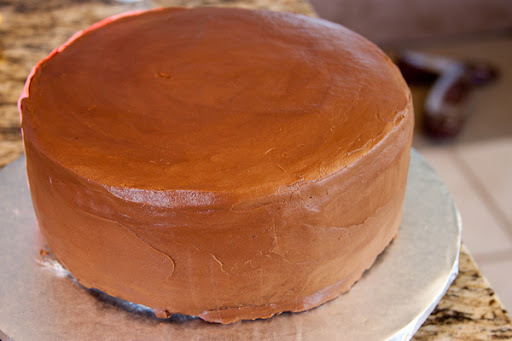 Since I spent all my time on the cake I made no dinner so we went to dinner and then got the kids to bed and then I stayed up to midnight to get to this point. 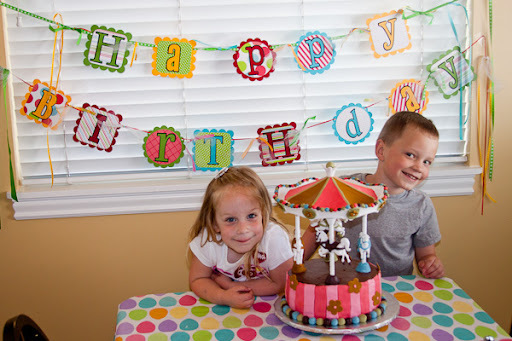 I had also got the just the top of the topper done as well. Saturday I finished it off about and hour or two before we celebrated by decorating the horses, and had my hubby help me attach all the balls to the topper edge. It was finally all done. 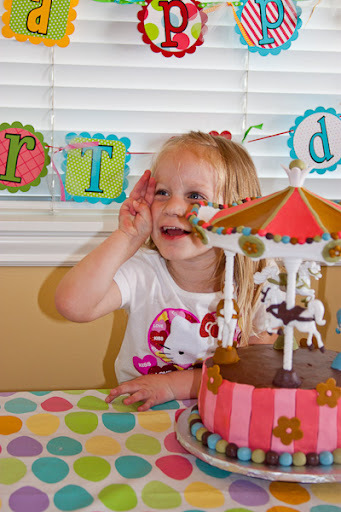 The happy birthday girl who loved that cake! Brother thought it was cool too! 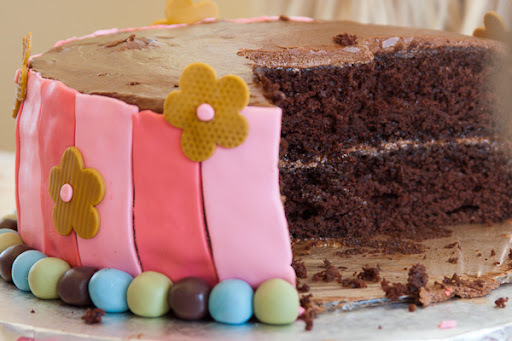 But the chocolaty cake was so good and so my sadness went away!! My favorite part was the chocolate cake. 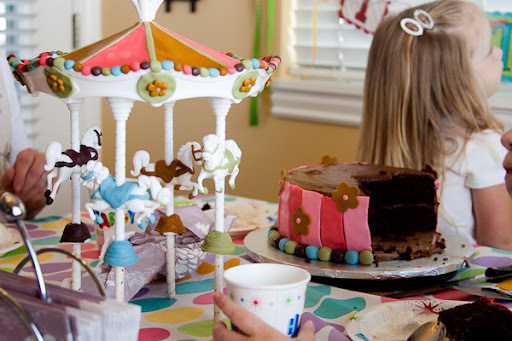 My kids favorite part was of course the MMF balls that bordered the cake. They were downing them, it probably gave them a tummy ache! Really cute cake Natalie!! I bet it did take you a long time I would have said it's just for looks not for eating:) I bet it tasted pretty great though! Glad she had a happy birthday! Awesome cake Natalie. Looks like it took a lot of time! A. Dor. A. Ble. I think it was totally worth the work. It looks awesome!